United States Secretary of State Rex Tillerson met External Affairs Minister Sushma Swaraj in New Delhi on 25 October. Tillerson arrived in India last evening for his two-day visit to India. He is expected to address the media in the noon today and later in the day, he will meet Prime Minister Narendra Modi at his residence. The U.S. Secretary of State's visit to India is a part of his five-nation tour that includes Pakistan, Saudi Arabia, Qatar, and Switzerland alongside. Yesterday, the U.S. Secretary of State paid an unannounced visit to Baghdad, just hours after returning from a similar surprise visit to Afghanistan. During his visit, he met Prime Minister Haider al-Abadi, who accused the former of interfering in Iraqi affairs. 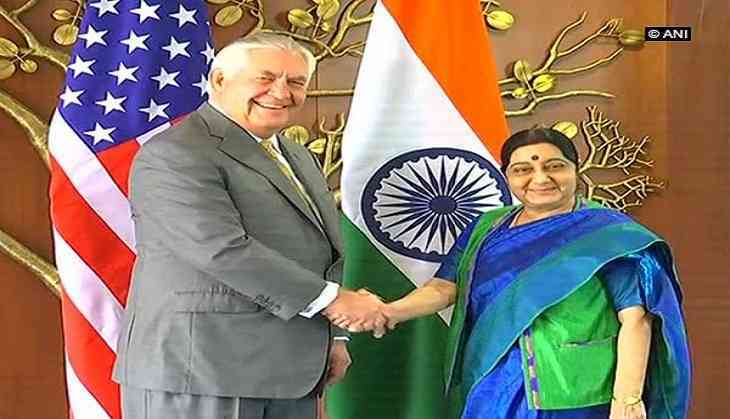 On Monday, while he slammed Pakistan, citing that there were a number of terror groups, which find safe havens in the country, Tillerson lauded India for a "positive role in the process to achieve a peaceful and stable Afghanistan". He gave this statement in Kabul, where he met with Afghan President Ashraf Ghani, Chief Executive Officer (CEO) Abdullah Abdullah and national security advisor Hanif Atmar.